Cushwa Center Lecture: "Father John Zahm, C.S.C., in the Founding of the University of Notre Dame"
During the 2017–2018 academic year, the University of Notre Dame celebrates the 175th anniversary of its founding. Rev. Thomas Blantz, C.S.C., will deliver the 2017 Cushwa Center Lecture on Rev. John Zahm, C.S.C., and his significance for the University’s history. 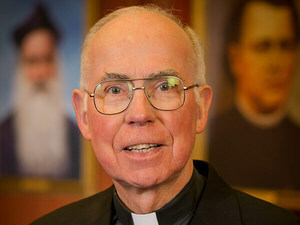 Father Blantz is emeritus professor of history at Notre Dame. His research and teaching focus on U.S. history and diplomatic and political history. He received the James E. Armstrong Award in 1997 for distinguished service to the University, as well as a 2001 Kaneb Award and 2010 Joyce Award—both for teaching excellence. He is currently working on a book-length history of the University of Notre Dame.